That being said, I still wanted to post some kind of Face Of The Day because I have acquired a lot of new goodies in the past few months and a lot of them are great stuff. I also understand FOTD is not FOTD without showing one's face so please excuse the selfies you're going to see after the break. I hope this post will serve as a brief rundown of what were on my face with short reviews, that's it. VISEE Glossy Rich Eyes #PK3 - This is a beautiful palette. All colours in this palette, or all in the Glossy Rich line, are pigmented, and infused with ultra-fine shimmers that flatter. The bottom left dark pink-wine is the head-turner, however when applied, it is not a stark flat colour. In this look I mainly used the top right golden pink all over the lid, and on the lower lash-line, with just a bit of the wine close to my upper lash-line. The golden pink is definitely a very wearable colour, reminds me of MAC All that Glitters. Compared to the Nudy Rich Eyes, I find Glossy Rich more long lasting on my lids, especially with non-creasing in my 'crease' or 'fold'. Remember to check out Kate and APei 's take on this palette. URBAN DECAY 24/7 Glide On Pencils #Zero - An old one I got in a set of 5 minis. Used this to tight-line the top water-line. Doesn't smudge too soon, but it isn't as creamy and pigmented as I wanted it to be. Just Okay. FASIO Edge Power Gel Liner #BR300 - With brief comparison to the Benefit option and swatches, I hope I have convinced you that this is a better pick if you are interested to try this new version of twist-up gel liner with a silicon applicator tip. So far, with a handful of uses, I find this to be fun to play with, not something I can't live without, but it does give nice results if it grows on your hands. I also find the formula very long lasting on my top lash line, so whatever shape or line you create won't move at all throughout the day. MAYBELLINE the Rocket Volum' Express - Not a huge fan. It holds my curl, separates and darkens my lashes a tiny bit, that's it. No added volume or length or anything. I also find the brush too big for my eyes. 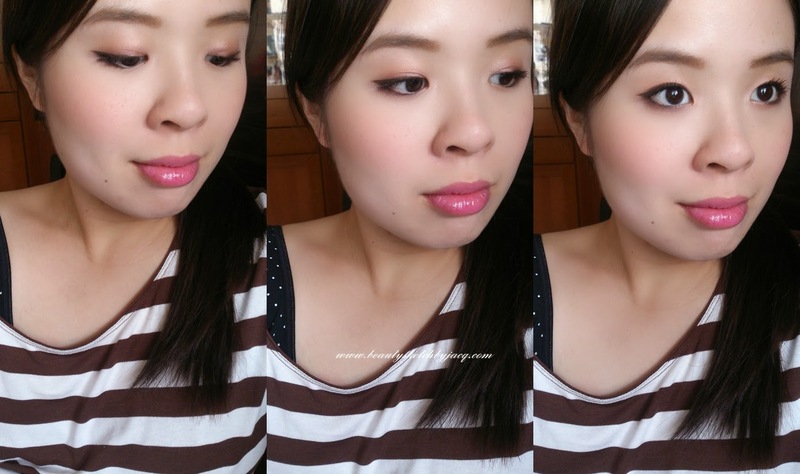 DHC Lip Cream - Current favourite in-my-purse compact lip balm. I remember it has olive oil and lanolin, both my lips love. It is great under lip colour. See the sharp flick at the tip of the wing? ANASTASIA BEVERLY HILLS Clear Brow Gel - Didn't love it, but use it regularly enough to almost finish this. The packaging is neat, and as it gets dirtier every time you use it, it may be smart for them to create the opaque tube. It doesn't tell you how much is left though. The brush head is kind of big and basic, I would prefer a smaller or slimmer applicator.